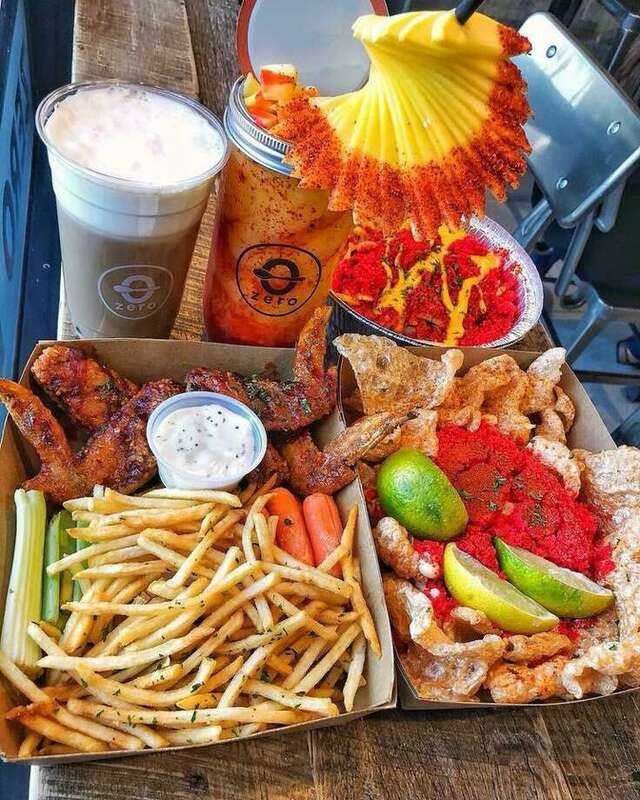 Pictures are some wings with a side of fries, XXTRA Flamin Hot Chicharrones, XXTRA Flamin Hot Elote and the popular Mangonada with chunks of mango on the straw. French fries covered in melted cheese and Flamin’ Hot Cheetos powder. Sweet milk tea with tapioca pearls in the bottom and crispy popcorn chicken with a side of fries. Both are featured on the unique menu at Zero Degrees Humble. The fast growing Asian-Hispanic fusion eatery recently opened its Humble location in mid-November. Humble Owner Edward Dang and General Manager Chris Le, a former Zero Degrees employee at the Willowbrook location, were looking for a great spot in the northeast Houston area and settled their business at the intersection of Townsen Boulevard and FM 1960 in the same strip center with Walmart. Le said the business partners thought about what look would appeal to the customers when renovating the store to meet their needs. The Humble general manager said what draws a younger crowd to the Asian-Hispanic chain is their usage of mason jars for their drinks, travel bottles and creative food menu items. The Mangonada, a mango slush with fruit chunks topped with chamoy is an all-time favorite for many on the Zero Degree’s menu. The drink also features Tajin, a chile powder, to give it a sweet, spicy and salty kick. When you visit Zero Degrees you will see many of the items there are topped with Flamin’ Hot Cheetos powder, such as the XXTRA Flamin Hot Elotes, XXTRA Flamin Hot Chilotes, XXTRA Flamin Hot Chicharrones and XXTRA Flamin Hot Cheese Fries. Zero Degrees is an Asian-Hispanic fusion inspired chain with with various locations in seven states. Zero Degrees has 8 locations in Houston area alone in areas such as Humble, Bellaire, Katy and Pearland with 5 locations opening up in Baytown, North Houston, South East Houston and Sugarland.